Eyewitnesses report running for their lives to escape a shooter at a mosque in Christchurch. Extremely sad day for New Zealand and the world. Christchurch terror attacks on two mosques leave 40 dead. PM Adern: Attacker is "extremist right wing violent terrorist", New Zealand was chosen because of its values which "can not be shaken". I am deeply shocked and don’t have adequate words to condemn the deadliest massacre in the mosque #Alnoor in #ChristChurch #NewZeland Terrorism is the worst enemy of our shared humanity. A self-avowed militant white supremacist has gone on a spree-shooting in Christchurch, New Zealand. He filmed himself massacring people in cold blood at the Christchurch mosque. This is so so horrific. We need more than 'thoughts and prayers' from our political leaders - stronger accountability for everyone and every institution enabling this culture of hate and Islamophobia. These attacks don’t happen in a vacuum. When Islamist inspired terrorists attack we ask who fed their hatred. We should ask the same question now. And we know the answer. this is appalling. in western civilization, we do not kill our opponents, we debate them. 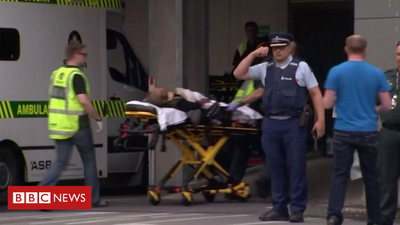 Christchurch mosque shootings: Forty dead after New Zealand attacks Horrific. May the dead rest in peace, the injured be healed, and the guilty be brought to justice. Horrendous news to wake to. Absolute misery for so many, caused by the vile hatred of a few.